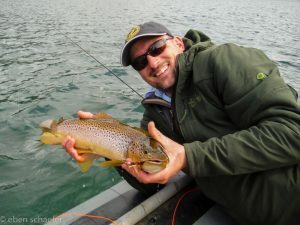 So I was lucky enough to go to Patagonia with David Force, one of our totally awesome fishing guides. I will try to do a few posts about this trip. I want to start by saying that it was an awesome trip. A real “once in a lifetime” trip that I hope to do many times!! David and I are making plans to go back soon. We will definitely post information about this! For right now, this first post will mainly be about travelling there and back. First of all, the actual travelling was pretty easy. I know a lot of people that get a little intimidated by a long trip to foreign countries. But this was a good one. I was already in Argentina near Buenos Aires. So I got an early flight out of the small, domestic travel Buenos Aires airport. I flew to Santiago, Chile and cleared customs, which was easy and clear with plenty of English instructions. I had a three hour layover and then got on a mid sized plane to go to Balmaceda. We had a stop on the way that was quick – I just stayed seated. And that was it, I was in Patagonia! Flying out of Balmaceda was a little chaotic. It is a very small airport and it was busy when David and I were leaving. But things moved pretty quickly. So I might suggest showing up a few minutes early but nothing drastic. I flew to Santiago again. I had a fairly short layover but David had almost eight hours! So pay attention when booking tickets! From here I flew to Dallas, then to Phoenix. I flew American on these flights and the planes were great. Plenty of room, comfortable seats, power for phones and laptops – standard 110 US plugs! Food was decent, service great. So, overall, the flying is actually pretty easy. Yes, it is a long way and a long time on a plane. You will spend plenty of time waiting in lines, etc. But you can get from the US to the Balmaceda airport in Patagonia in less than 24 hours. And you don’t need to speak any Spanish. All the airports have their signs and their announcements in Spanish and English. Sometimes the English has a pretty strong accent but it is English! I think out tickets cost between $1300 and $1600 after a lot of shopping. David and I both ended up booking on CheapoAir. A few quirks but definitely the best price for us. We did add travel insurance for a reasonable price. Just follow the directions for customs and all is easy and straightforward. I met David in Coyhaique at a great hotel in town. El Reloj http://www.elrelojhotel.cl/ It is a boutique hotel and funky in some ways. But it had nice rooms, a cool lobby/sitting area, a nice restaurant, and a really great place to hangout in the back under some apple trees with great views. Eduardo from Magic Waters picked us up at the hotel in the afternoon. But most guests get picked up from the airport. The airport is very small and it easy to find people. Eduardo has a crew cab pickup and a passenger van depending on the size of the group. The communication about everything was great and on time. The ride from town or the airport are about the same length. 45 minutes on roads of varying quality and lots to see. A common theme for the whole trip was lots to look at! The other common theme was rough roads, but all the vehicles seem ready to handle them. We never saw much traffic and we felt safe with everyone’s driving. Travel to Patagonia is long and tiring. But really not that hard. Spanish is definitely not required. You can usually find food and drink that you recognize as well as regional food while travelling. And it is an awesome place to go! David and/or I are going to act as a host for an Orvis trip or two. And we would like to put together a group of our own. If you have any interest in a fantastic trip in the winter email me at eben@hubya.com. We don’t have specific dates yet but we are working on it! I’m working on a hotel plan for Tierra deal Fuego Chile Eben. Maybe we should get it Orvis endorsed, and I’ll have a room for you. I’ll keep you posted. On to Kamchatka Russia next. Let me know if you need help with anything, Matt! Sounds like you are having a lot of fun these days! I had great luck with LAN going to Argentina. So I have nothing bad to say about them at all. Bummer to hear about American and their lack of help. I have had good luck with their service in the past.